Here are books I've found useful when educating myself on the political and economical history of Ireland - invaluable background to understanding how and why certain record collections came into being and why many never existed or failed to survive. History of course can never be completely objective and authors make their own interpretations of events and embellish the narrative with their own opinions, but if reading more widely makes you stop and think hard about what our ancestors lives were really like day-to-day, then we've remembered them as more than just names on a list. The images are mostly the editions I own and have read, but click on any image to take you the Amazon page for further information on the latest available edition. Of course many of these titles can be sourced elsewhere, including second-hand. In fact, for historical context in particular, second-hand bookshops, websites and stalls at family history fairs are a treasure trove of more esoteric material, often illustrated with rare photographs. Another great hunting ground for antiquarian books on Ireland is the Internet Archive where international libraries and academic institutions often publish digital versions of their out of copyright treasures. The IGRS Facebook page recently alerted me the Boston College Libraries' Irish History books published on here with 756 books listed - well worth settling down for a browse. 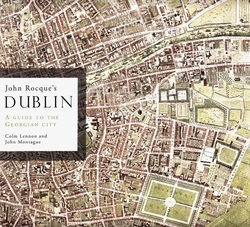 This is a beautiful book and even if you don't believe you have any Irish ancestors who ever set foot in Dublin, buy it to admire the intricate detail of the maps and engravings of the 18th century city. John Rocque was a surveyor and cartographer with an eye for detail and design - every single house is depicted. Be sure to take note of the older street names that precede some we are more familiar with today as these will be the places named in contemporary records. It's also fascinating to see how compact the Georgian city was compared to its current sprawl. You can find full size reproductions of his map for sale in some of the bookshops in Dublin (contact me and I'll tell you where I got mine) or you can buy it from the Royal Irish Academy website. This book accompanied the 5-part BBC documentary series presented by Fergal Keane in 2011. It takes the reader from the very earliest years of Christianity in Ireland right through to the modern day. As with any history of Ireland, you never get too far away from religion and the constant threat from its immediate eastern neighbour when it comes to explaining cause and effect in the ebb and flow of the island's fortunes. I enjoyed learning more about Ireland's role in Europe through the centuries as perhaps as genealogists, it's all too easy to dwell on the English legal and cultural influence on many of the surviving records. Try to watch the TV episodes on catchup or perhaps even buy the DVD as Fergal Keane is a good presenter and, except for an excess of background fiddly-diddly music aside, he presents an entertaining story, illustrated with original images. This book was first published in 1967 and is comprised of a series of essays written by many different contributors covering sequential time periods. This is very useful if you are trying to interpret evidence found in a specific span of years, say land leases at the time of the Penal Laws. Unfortunately Amazon does not offer the "Look Inside" feature for this book which would let you see the essay titles which would also let you see how the latest editions bring the history very much up to date. Sorry, no picture of this one and I've no idea where you might get your hands on a copy. Another one of my second-hand treasures and I include it as a great example of the type of book that will give you a very different perspective on Irish history. This book was one of a series called Collins National Anthologies which included all of the other nations of the British Isles plus Australia, Canada, New Zealand and India - all fertile hunting grounds for Irish kin too of course, so of course I'm in the market for old copies too! The book comprises of prose, poetry and photographs reflecting on Irish life. The chapter on customs and beliefs, for example, paints a vivid picture of country marriage customs and funeral rites - "Getting married is no carefree, personal matter; one's whole kindred help, even to suggesting candidates."